At Carapook, which is situated about eight miles from Casterton, off the upper Coleraine Road, a monthly afternoon service has bee held unbroken from the earliest times. When the Rev. W. J. Gillespie was settled in the Charge, Carapook was the most thickly populated portion of the Charge, omitting the townships. A list of the settlers, prepared by Mr. Wm. McBean (father of Mr. A. McBean), for Mr. Gillespie, showed more than 60. At first the Services were held in Mr. Templeton's house, in what is now Mr. A. Murray's dining-room, and afterwards in the Temperance Hall and State School, behind the present township. The State School Teacher at the time was Mr. C. Radford. A Sabbath School was early begun by Mr. J. G. Proudfoot, one of the pioneers and mainstays of the Carapook Church in those early days. Mr. Proudfoot left the district in 1881 for New South Wales, and now resides at Murwillumbah, on the Tweed River. The attendance of scholars under the superintendance of Mr. Proudfoot was about 40. In 1911 the roll numbered 22, with an average attendance of of 15. 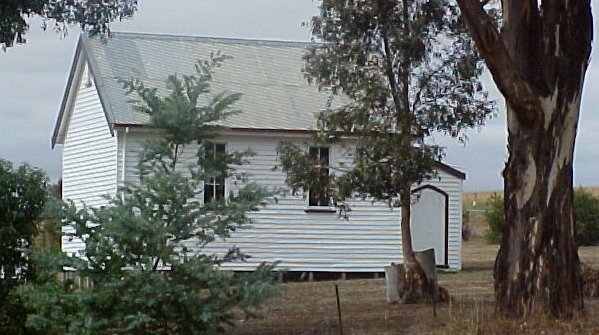 Services were subsequently held in the present State School, and continued there until the building of the Church in 1884. It is said that the Church building, of which Mr. Brown, of Digby, was contractor, cost only £80. The site had been acquired previous to 1879, and Trustees were in that year nominated by the Congregation, appointed by the Presbytery, and duly gazetted. They were Messrs. J. G. Proudfoot, John Ferrier, Dugald McDonald, Wm. Hutton, and Wm. Matheson. All of them have since removed from Carapook, but three are still living. The Sunday School has been carried on almost continuously since its beginnings in the early years of the Church. Miss Murray, in conjunction with Miss Hayman had charge of the School for some years previous to 1902., when Mr Dalton became Superintendent, and continued for several years. Since his death Miss Murray has carried on the school single-handed, with noble earnestness and devotion to this work amongst the children. Miss Jelbart was Church Organist for all denominations for more than 25 years, and supplied her own harmonium when the Services were held in the State School. On two occasions presentations were made to her in recognition of her services. An Organ subscribed for by all denominations, was purchased, and still does good service. In 1900, Miss Carrie Hayman succeeded Miss Jelbart and continued Organist until September 1902, when Miss Murray was appointed, and she has filled the position for all Services since that time, assisted by the singing of her sisters. Carapook has sometimes had representatives on the Casterton Committee, and sometimes managed its own affairs by a local Committee. During the pastorate of the Rev. J. L. Phillips there is a record of a meeting of the Committee, at which were present the Minister and Messrs J. Ferrier and D. McDonald (Secretary and Treasurer). At that time Carapook was expected to send £25 per annum towards the Stipend Fund, and the previous year there was a slight shortage of £2 12s 3d. An entertainment was projected to augment the Church Funds. For some years Carapook has not made its Congregation responsible for any fixed amount, but all monies raised are sent to the General Account. The oldest folk at present are Mr. and Mrs. Cotter, sen. Foremost amongst the workers of the past have been Messrs J. Ferrier, D. McDonald, W. Hutton, and J. G. Proudfoot; in more recent times, and continuing to the present are Mr and Mrs A. Murray and family, Messrs McNicol and others. Since 1910 Mr. Murray has beeb Secretary, and Mr Wm. Laird Treasurer, the other members of the Committee being Messrs. J. H. Stark and D. McNicol. Communion Services have been held at intervals, the first notice of one being in May, 1899, but no record of such being held exists. An Annual Communion Service is now held, and the membership in July, 1912, numbered nine. 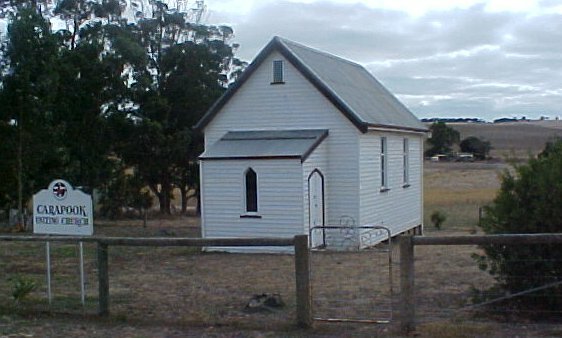 The Methodist and Church of England hold monthly Services in the Carapook Church.